Ojai is blessed to have an active and accomplished artist community. 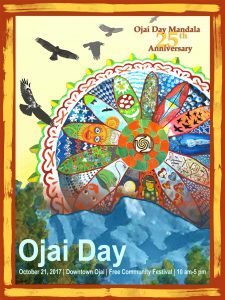 Over the years, notable artists have donated their work to serve as the Ojai Day poster and this year is no exception. In celebration of 25 years of the Ojai Day mandala, we are extremely fortunate to feature the work of Mandala Maven and RTK Tile partner Mary C Kennedy. The piece features Chiefs Peak gazing up at a past year’s mandala with our valley’s beloved Condors flying above. The poster has been an important part of the Ojai Day tradition for over 20 years. Each year, storefront windows along Ojai Avenue are filled with the poster, announcing that it is October, and October in Ojai means Ojai Day. Many talented and noteworthy artists have participated in this time-honored tradition including Susan Guy, Kent Butler, Bonnie Caruk, Colleen McDougal, Jack Davis, Guy Wahn and many more. Since 2012, the poster has been generously sponsored by Herald Printing in Saticoy. Stop by the Recreation Department, City Hall or the Information Booth at Ojai Day to purchase this or past year’s poster.